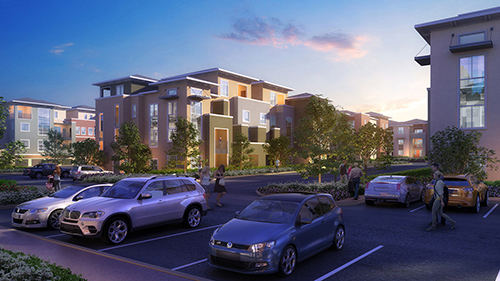 Construction has begun on Elysian at The District, an upscale, 360-unit rental community in Henderson, NV. The project, a development of The Calida Group of Las Vegas, was designed by KTGY Group Inc, Architecture + Planning. The 18.95-acre development is located off I-215 and South Green Valley Pkwy, anchoring The District at Green Valley Ranch, where residents can take full advantage of one of the most dynamic retail, dining and entertainment districts in Las Vegas. Located at the northwest corner of Paseo Verde Pkwy and Desert Shadow Trail in Henderson, Elysian at The District's residential configurations consist of townhomes and flats, ranging in size from 740 sf to 1.9k sf. The 33-building rental community offers open floor plans and includes studios, 1-bedroom, 1-bedroom + den, 2-bedroom, 2 bedroom + den, and 3-bedroom units, with third-floor premium units with mezzanine levels and roof decks. Residents will enjoy large bedrooms, private garages and upgraded finishes such as Quartz countertops and backsplash, premium fixtures and lighting, sustainable flooring, custom cabinetry, Energy Star stainless steel appliances including in-suite washer and dryer, water-saving fixtures, and spacious walk-in closets; also, tall 9’-18’ ceilings, abundant oversized windows, and a private balcony, patio or porch. Many of the units have great views of the Las Vegas Strip and mountains. The project will include both townhome-style units and stacked flats to appeal to a variety of upscale tastes. There are 50 townhome-style units, which range in size between 1.2k sf – 1.9k sf, offering two-story living and include attached garages. There are a total of 310 stacked flats in four different stack flat buildings with 10 to 20 units per building. The buildings feature third-floor penthouses with mezzanine fourth floor lofts. Unit interiors will include modern cabinetry and upgraded energy-efficient appliances. The community amenities feature three large community buildings, multiple pools and spas and several amenities not typically seen in apartments, including an indoor cabana room that residents can reserve for a party or special occasion (much like several of the casino pools). The community also includes a state-of-the-art fitness center, leasing office and outdoor lounge areas. The first phase, which includes 122 units, will be completed by the end of January 2015. Preleasing will begin in October.